I just had to do a double take there when I realized I was already on day 8 of cleansing. It’s seriously been that long? This morning I finished reading the book, Green Smoothie Revolution: The Radical Leap Towards Natural Health by Victoria Boutenko. I’m always learning something it seems and this book showed me how I still have lots more to learn about the human body, greens, vegetables and things I never considered like edible flowers. Boutenko shares her research on the power of greens. Like, did you know leafy greens contain all essential minerals, vitamins and every single amino acid that humans need for the most favorable condition for growth and reproduction? Juicing greens is the best way to absorb them because greens are high in cellulose; a substance that is not easily dissolved the main constituent of plant cell walls and of vegetable fibers. Juicers break down cellulose making it easier to digest, and taking away the hard work that may upset ones stomach. You will still get these essential fibers though; juicing does not completely filter them out. The fibers in greens are important because they slow down the absorption of sugar from fruit. This is why many green drinks have fruit in them too, it’s a powerful combination for your taste buds and body. 1. Unripe fruits (green grapes, melons, limes, pears, tomatoes) contain enzyme inhibitors that slow down the digestive process causing irritation to the intestines. They are also difficult to digest due to their high starch levels. 2. Consuming large quantities of the same type of alkaloids found in greens can be harmful and even poisonous. Thus, rotating greens is the best way to go! 3. Sprouts are very high in alkaloids and should be used in moderation. 4. As a child and during our teen years most of us were told to eat slowly so we wouldn’t get a stomachache or so we could actually tell when we were full. I never really understood the science behind this expect that it must help our digestive tract. From Boutenko’s findings I now know that if one does not chew their food fully it will affect the hydrochloric acid in the stomach. Eventually causing the people to have low levels, and they will no longer enjoy the taste of greens. So savor every bite! This is the body’s way of signaling that it can not handle it. I highly recommend this book to anyway who is looking for some inspiration on how and why they should incorporate (more) greens into their diet. There are several pages of recipes for juices, smoothies, skin elixirs, pet smoothies and drinks for children. The recipes have all been wonderful except it is difficult for me to find several of the ingredients, especially when it gets to the section with herbs. Yesterday and today have been beautiful sunny days here where I live thankfully. Being raw and living in New England is not easy (the body isn’t as warm because it doesn’t have as much work to break down food), I already feel cold most of the time and because of juicing I feel cold more often. Brunch-> Popeye Has Gone Bananas! Overall feeling today was relaxed. It was my day off; I completely organized my bedroom differently and threw away some old knick knacks from over 10 years ago. I went to a heated yoga class for an hour and fifteen minutes and half an hour or so after that I was yawning. In yoga class it was easy to laugh and smile something that is actually pretty difficult at times. 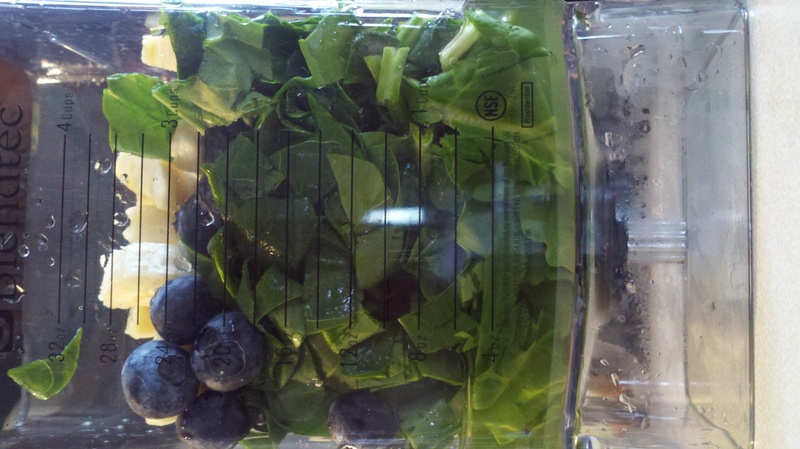 I have my greens soaking for tomorrow so they are already to be juiced before work. I wake up around 4:30am, it’s a great help to have this step all taken care of. Especially since my lettuce and kale look extra dirty. 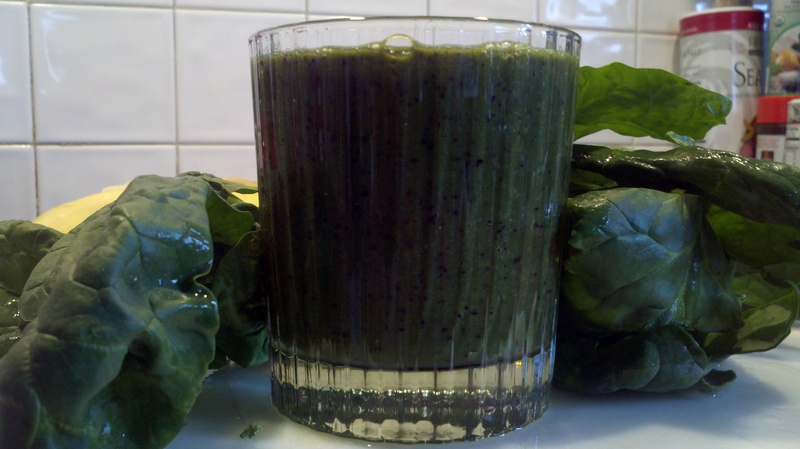 Category: Uncategorized	| Tags: Alkaloids in greens, Banana, Blueberry, cleanse, cucumbe juice recipe, Cucumber, Cucumber Refresher, detoxing, Fiber and Juicing, fully chew food, Goji, green lemonade, Green Lemonade Remix Recipe, Green Smoothie Revolution, Green Smoothie Revolution: The Radical Leap Towards Natural Health, Green Smoothie Revolution: The Radical Leap Towards Natural Health by Victoria Boutenko, hydrochloric acid, Juice Cleanse, Juice Detox, Kale, lemon, pet smoothies, Popeye Has Gone Bananas Recipe, rotating greens consumption, Rotating Greens in Juices, Smoothie Recipe, Spinach, Strawberry, Strawberry Goji Smoothie, unripe fruit, Victoria Boutenko, Why Juice Greens, Why Juice?